I did some actual meal planning this month which is rare. I typically just buy an array of veggies and make stuff up as I go. I had an idea for stuffed poblano peppers that turned out to be SOOO delicious even though it's a multi-step recipe (I like to keep it simple). You can see that recipe here. I also created a smoothie with rose water that tastes so divine! You can see it here. Maybe one day we'll renew our vows and I'll carry a veggie bouquet. Too much? ha! A dear friend got married and we had a blast at her wedding. There was an open bar. Our table of friends were one of the few taking full advantage. I had a tough time breathing while dancing. On the way home in the car in driving rain we talked about the possibility of going back to the doctor and it brought up SO MUCH FEAR. I wasn't ready. My body wasn't ready. All these months later and on the other side of the dilation procedure I'm seeing how necessary those early conversations were. It's so important to check in with your body every step of the way. It will tell you when it's time and you'll be better prepared for having gone through all the emotions along the way. At least that was the case for me. Super fun family dinner at Benihana for my uncle's birthday. I wrote a post about eating out and staying sane. A dear friends mom transitioned and it hit close to home. Lisa wrote a beautiful post about Linda. Will you read it and send her some love? An old and trusty wine list that lives folded in a friends wallet got pulled out at family night. Silver Oak is my favorite! Cliff and I tasted there and bought a few bottles on our engagement weekend in Napa ages ago. Best $100 bottle of wine I've ever had. A love gift arrived in the mail. I LOVE mail! That sweet coffee mug became a fast fave and made the cut to get into the RV! AND THOSE Produce candles! The Kale one is my favorite and smells divine (it doesn't smell like kale). Movie in the park with Aunt Mary. A food docu. At some point can one see too many food documentaries? A moment that begged to be collected. I love that we go and get out of bed as a family most days. Found my mom's ring going through a box of old jewelry. One little birthstone for me and one for my sister, Kayla. Every time I look down at it I can see it on her finger. His words to me on a particularly rough day. Felt like they could help more than just me. This is our Game of Thrones Sunday night ritual. Big beer in horns. Can't wait to see what will happen next season! Cliff rescues animals. It's one of his super powers. This little one was scooped up out of the middle of the street on our way to the track. That's his happy face, really it is. I'd really like to sleep that soundly. I started Drop In Group Health Coaching called Togetherness Tuesday. From the first call I knew it was going to be special but I never dreamt it would come to mean so much to me and the women who show up on that call each week. You can start and stop whenever you like. Phone line and hearts are wide open. More information over here. Angeles made one of my quotes into a beautiful FREE downloadable poster! You can see it and all my free downloads over here. March, You were all about the UMPH! I spent a week working and playing in Austin with Kayla and Chloe. Ate lots of raspberries and guacamole with truffle oil. Got a proper hair cut + blow out. Feels so good to look totally different for a few days. When I got home Ned had his yearly shots, he wasn't amused. He's a totally healthy fur face at nearly 14! 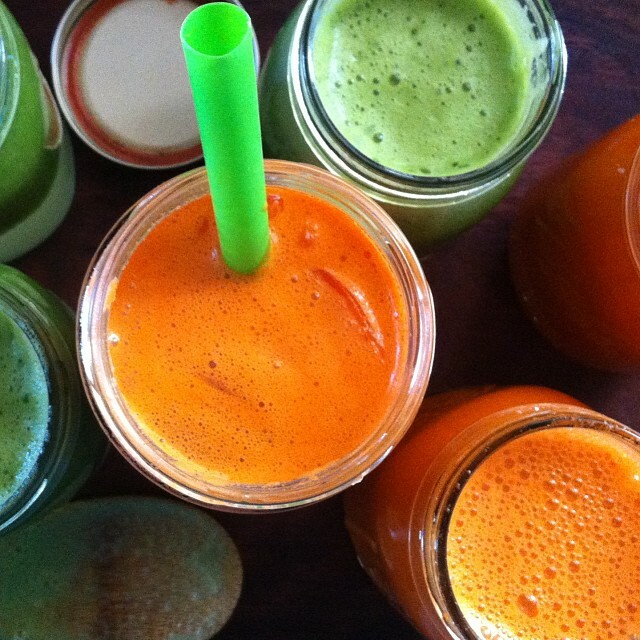 I lead Juice, Blend, Repeat and felt healthy, present, fit + strong. It's the best I've felt in my skin all year (so far). We FINALLY found a natural deodorant that works for both of us after trying what felt like every brand at Whole Foods. It's called Herban Cowboy and that makes me laugh every morning. His + Hers. Got on a cucumber kick. Cucumber salad. Cucumber in my water. Cucumber in juices. Must have needed the hydration. I have made a practice of listening to those body ques and honoring them. After much conversation on the WHAT NEXT we started looking at RV's! Among the first was a really an old converted bus. It was a resounding NO, too old, too dirty and the ceiling was too low. BUT it solidified that we actually really want to move forward with the plan to purchase, renovate and live in an RV! We got to meet the cutest donkey on the way. Doesn't looking at him just make you happy! I covered our fridge in Instgram prints. It's the little details that make a rental feel like home. I ordered prints from here + used magnetic tape from the craft store to make em stick. About a 1 inch square on the back of each print. Aunt Mary and I went to see Miley Cyrus. I had a blast deciding what to wear. Leg warmers + leggins always spell party to me. I took my favorite selfie lately. I've always been a really toothy, cheesy smile kind of girl. At 35 I'm feeling softer, less cheesy, more authentic and that's what I see + feel what I look at that photo. Aunt Mary goes to sooo many concerts. She's always loved them and I forget how much I love them until I go to see one with her again. The energy of the music, of all the people gathered from all walks of life, the people watching! It's all pretty incredible. Neither one of us are crazy Miley fans, we probably know 3 of her songs between the two of us but we agree that the girl is a marketing genius. The concert was right in line, over-the-top, all about the party and yes she does ride a giant hotdog that flies through the air. I had a blast! Kale Yeah tanks + tees arrived and I love them. I especially adore the tank, wear it all the time. You can get yours here. Created a crazy good stuffed Poblano pepper recipe with quinoa and loads of veggies and a cashew cream sauce that is mmmmmm delish. My new favorite glass compliments of my mom's bestie. She totally gets me. We started appreciating, really appreciating the details of this home we've created. The idea to live in an RV is getting serious and things here are starting to feel really impermanent. That feeling when you know it's all about to change. I started receiving picts of people in their NEW Kale Yeah T's! Kenzncreed (that's her Instagram name) has been an internet friend and follower since my first blog. Anytime I start something new she's always there to support me. Thank you, I'm so grateful for you @Kenzncreed! Two of my friends from Boston, Molly + Lizzy came to see ME! It was an incredible weekend of togetherness. The kind where you feel really fed and recharged. They wanted to do Texas stuff so we ate Tex Mex and I took them to the Boot Barn. Lizzy cried. We're all pretty sure she was a cowgirl in a past life. Just the smell of leather alone sends her into happy tears. We got to cuddle a sweet new puppy outside of said Boot Barn. Thank you for making this trip happen Lizzy + Molly! I will remember sitting together in our living room talking and talking and talking and sitting in silence together. So much love, so much healing. Excited to be together again at your wedding in August, Molly! Sooo excited! Left Kale Yeah stickers at my favorite Raw Vegan restaurant in town. Got three new cutting boards. I intended to get one but they clearly wanted to stay together and so... Larry, Mo and Curly came home to my house. Some days I call them Harry, Ron + Hermione. Aunt Mary invited me to The Cowboy Solution. It was incredible. We spent a day with the horses drawing parallels in all things life + leadership. I appreciate how present horses are, how responsive and trusting. They reminded me over and over to do as much as I need to and as little as I can. That when I get what I want to STOP ASKING. To keep it simple, speak clearly with my words + actions. To celebrate often. To trust. February was 28 FULL days! Cliff and I celebrated our 6 year wedding anniversary. Marriage is cool. Got to hang out with my little brother a lot (but somehow didn't take a picture together). Seeing those two green smoothies takes me right back to that morning and chatting with Cody. Grateful for that time. And that one of me totally blissed out over that smoothie was post a two week cleanse. Best move ever. The cleanse and the post cleanse smoothie. I was gifted the most beautiful and thoughtful quilt from a client who has completely changed her life, diet and her health. When my mom saw it she cried and said "she speaks our language." You really can feel the love coming from it. It's hanging in my office, I see it everyday and feel tremendous gratitude for getting to do this work that I love so much. My gf who moved to Canada came back and we had the best lunch and catch up. The best. Cliff and Ned share toast. Ned likes to lick the ghee off of it. It still grosses me out a bit but it makes them so happy. Felt like one of those moments that NEEDED to be documented. We got to meet a rescue pup named Charles and we fell in love. The endless patience and kindness that is required with a rescue takes a special human and a special beast. When I hear someone say they've got a rescue it's like a giant check mark goes into their "good people" box. Food was simple + beautiful all month long. I did a two week cleanse that was PROFOUND. I wish I could say I was still feeling the positive effects... I went back to my usual routine post cleanse and I'm seeing how it's time to change up the routine. Always evolving. Always looking toward healing my trachea. Convinced that spontaneous healing is coming. My Aunt celebrated her birthday with a painting party. It was one of those paint studios where everyone paints the same thing. Total blast to see how each person negotiated the process. That picture in the car is a giant balloon! We rode with TWO of them in the truck. One smooshed between me + mema and one between mom + Tom. Epic. Hilarious. Cliff went to California for a couple of weeks to take care of the family cabin + see his mom. That's when I did my cleanse and spent a ton of time with Ned. Quality Ned Time. Also started a huge photo and story gathering project. Going to finally, finally make a scrapbook of my childhood. Took Cliff to my hometown for the first time. It was a sweet walk down memory lane. Attended a couples dinner for a friend from HS who's getting married this year. Fun dinner... laughed a lot, ate rich food, drank and lot of wine and then paid for it the next day. Completely underestimated the need to ease back into life post cleanse. Got to spend time with my mom's best friends. They've been friends for over 20 years. Awesome people, awesome friendship. Charles is the newest addition to their pack. Discovered a willful little mutant carrot in the garden! Happy find. Told the story behind how the name lacylike came to be. January in pictures.- Proclaimed 2014 the year of Ease. 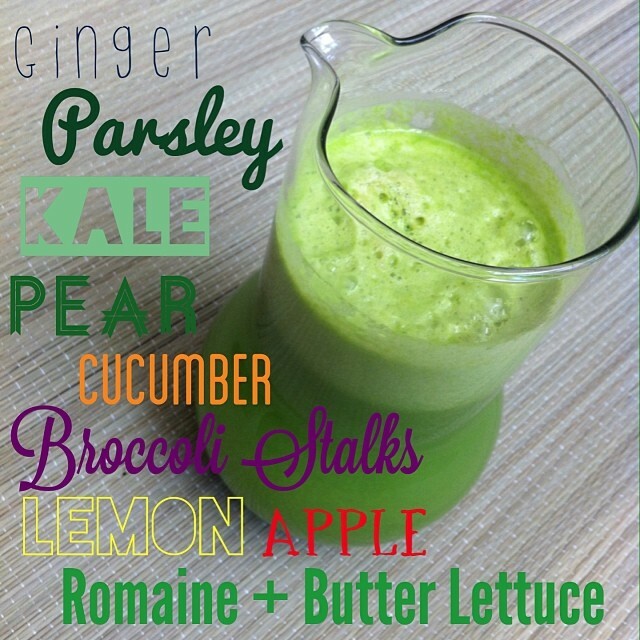 - Lead my newest ecourse called Juice, Blend, Repeat. (it's starting again in March, join us!) As if I could love juice and smoothies any more! This cleanse makes me sooo happy. - Made lots of simple + tasty food all month long. - Got into a popcorn for dinner kick and liked it. A lot. - Drank copious amounts of peppermint tea. - Ned started sleeping under the covers in the mornings. We think pretty much everything he does is adorable. - Received little crochet veggies in the mail, totally made my day. - Celebrated my 35th birthday! I love birthdays and the celebration of that moment when this journey started and all that's happened since and all that's to come. Woke up to flowers, smoothie and a decorated living room complete with confetti and streamers. The best. Spent the day surrounded by some of my beautiful family! Love the ease that is being around my family. Dressed in clothes that make me happy (ahem leg warmers, stripes, teal, best bday gift pants ever, and baubles). I remember when 35 seemed SUPER old. Today I feel anything but... I'm happy in my skin, in my relationship, my career... my life. Today I sincerely feel like I have everything I need (and always have). Just so grateful to be alive, to be surrounded by love and for what's to come (whatever that may be)! - Went to the beach for a birthday overnight-er. Rode roller coasters with Cliff and laughed til my stomach hurt. - Kayla sent me the sweetest photo of Chloe sipping green juice naked in the backyard. The goodness, the innocence, the freedom of that one photo...everything about that juice loving little girl makes me happy. She currently thinks the word for cat is Ned. We Face Time... well Chloe and Ned Face Time and she gets so excited saying "Ne, ne, ne" and doing the sign for cat (which looks like drawing whiskers down your cheek). December day in the life. I wake + water. Big into water in the morning at the moment. I drink up to 22 oz before getting out of bed. Or I get up and pee and get back in bed to drink my water. Probably TMI - but I use the water for 1. helping to get my system going in the morning and 2. to aid in getting rid of the last bit of weight I was working to lose. His and hers house shoes on the daily b/c it's COLD. Morning smoothie to get greens and super foods into my body first thing. And then work in my home office with Ned. Went to Boston for my annual December trip to visit friend and this time got to meet Leigh's perfect little people, Graham and Ruby. They're wonderfully different in every way except that they are twins. Leigh wrote a super sweet blog post about them over here. It SNOWED and I geeked out (no snow where I live)! It was so beautiful! Enroute home a 3 year old girl was throwing an all out screaming at the top of her lungs tantrum. I slipped her mama a free drink coupon and a sweet note to hang in there. It was an awesome moment. More about it here. Chloe ate her first vegan pancakes and totally loved it! They've become a staple when we are in the mood for a breakfast treat. Highly recommend! Cliff makes the pancakes, I make the mimosas. I got a surprise Christmas gift from Buck + Libby that was completely RAD! CODY CAME HOME from his 6 month journey to South and Central America! We made the rounds for Christmas and were done by the 23rd. A big perk of living nearby our family there was almost no travel and complete ease. We spent Christmas day just the two of us. My fave gifts from Cliff were a super sharp knife + a guitar! Fave, fave, fave gift was my soul make necklace from my mom. Best Christmas I can remember in years. Got to meet Fully Raw Kristina at a raw foods class she taught. Gave her some of my Kale Yeah stickers and she said "OMG I have this sticker!" Pretty cool moment. Love the work she's doing getting more fruits and veggies into peoples lives! Wellness warriors unite! Set my calendar for the first 6 months of 2014. Three eCourses in the line up this year and heading towards three group classes. This is going to be a big growth year. Excited + ready! So proud that I completed a years worth of photo journaling here! Here's what I remember most about the year. January Portland. Atlanta. My 34th birthday - stayed at the Icon Hotel in Houston (love that place). Amazing birthday weekend. February Our 5 year wedding anniversary. Manzanita, OR for a girls weekend that would change everything. Dinner with Tim + Mich at Uch which can only be described as a religious experience. March Best weather of the year. Road trip to show Cliff Bluebonnets. Color Run! April HELICOPER ride! May Boston + Austin. Retreat with Mary + Kayla that was amazing. June Went to Dallas to see friends. Lots of swimming laps with Cliff. Best laughter of the year with Cliff while he was reading his story about The Hinge. Cody left for his adventure and perhaps the biggest... we put in backyard pathways for Mema. Cut the grass out and left the most gorgeous stone pathways. July Was FULL. Ned turned 13. Chloe turned 1. I started Barefoot running. Went to Boston for a baby shower. Went to Santa Barbara on vaca with Cliff. Had the MOST magical time underwater ever in Catalina. Saw John Mayer with Aunt Mary. August We went to Vegas to celebrate my little sis turning 21! September Incredible experience with dolphins. October My APP came out! Cliff did a Tough Mudder in what felt like a zillion degree heat. November I ran a mile a day and it changed my life. Journal Entry, November 30th I just finished my 30th mile this month! As I rounded the track for my last lap I felt tremendous pride. I smiled all the way in. Walking home all red faced and happy it hit me. T H I R T Y D A Y S. I did it. Tears... of incredible gratitude. I showed up for myself each and every day for the last 30 days. I loved myself enough to do this. This will be one of the accomplishments that I am most proud of this year. I ran through it all. Good days and really bad ones. Feeling amazing, feeling hungover. Rain, sunshine. In the cold with as many layers on as possible and in the heat with as few layers as possible. On the track, on the road, on the trail, in town and out of town (sounds very Dr. Seuss and I like it). I ran every.single.day this month. The truth is... this month I didn't always breathe with ease. I had some really hard days. Some days that made me doubt. Some days that made me deeply sad. Running didn't seem the most logical choice but I did it anyway because it makes me feel good. Because I made myself a promise to do this one thing. And because I deserve these 10 - 12 minutes a day to move, to breathe, to listen to music that soothes me. TEN TO TWELVE MINUTES! If I can do it, you can do it! I made a few notes along the way that I thought I'd share with you in case you'd like to give a #mileaday a try! You'll see the ebb + flow of it all. Some days = totally stoked, others = not so much. Day 1 - 3 Overall feeling.... I can do this. Day 4 + 5 Must get run in.... it was the only thing I made sure I did all day. Honestly, eating suffered b/c I wasn't planning. Day 5 Posted on Instagram with a love note to myself. "Dear Me, Proud of you today. For being flexible, for showing up, for getting your #mileaday in even after you forgot your hat and saw that the track was filled with pre pubescent boys and you had to go with plan B then plan C. I see you working for what you want from a loving place. I see you moving through your days with your #wordoftheyear by your side. You're doing a great job. Keep going." (my word this year is Genuine) Day 6 A little boy from seemingly out of no where jumped into my path and gave me a high five. It changed everything. I felt incredibly inspired and supported. Day 7 Noticed that I got out of bed without creaking and easily jump up from the couch. OH I LIKE THIS. Day 8 - 10 Getting inspired to organize + clean at home. Fully embracing it. Day 13 Freaking freezing. The weather challenged my resolve. Day 14 Hey this is easier and I'm not afraid of being a little cold. Boo-ya! Day 15 MAN that was tough. Amazing how each day is SO different. Makes me hopeful that tomorrow will be a breeze. Day 16 + 17 Total breeze! Love the ease of running on the weekend. Nothing else to do, no where to be. Freedom. Day 21 My feet hurt. moved a little slower, hard breathing the past few days. New life today as I watched a food documentary. Feeling empowered. Running is a part of my healthy life. Day 24 Sunday. Craving a day off on Sunday. Pep talk myself --- 'It's just a mile. Get er done and go about your day darlin. You've got this.' It worked. Day 25 This feels like a part of my daily life now. I definitely prefer running before noon. Feels so good to get it done and get into my work day. Day 26 It's cold. And raining. I take to the street instead of the track. A lady going to her car smiles and yells out "you're my hero, run one for me too." Day 28 Thanksgiving. Running by choice... on a holiday. This is a first. Feels good to be out in the world. It's so still out today. I believe that we are divine, infinite beings and that we can do + be anything we want. I believe that we are so powerful and if you move toward what you want there are incredible forces that show up in support. P.S. How you run is really important to stay free from injury, stress or strain. Here's a post I did on barefoot running. Here's what else happened in November! Food this month was super simple. Lots of smoothies + juices. Several days of our idea of "fast food." Quinoa pasta + organic pasta sauce from a jar, few cloves of garlic and zucchini. Shared the way we clean around here (baking soda, vinegar, lemon...the way your grandma used to clean house). Latest order of Kale Yeah stickers arrived! I've gotten into the habit of leaving a few with the check each time we go out. I really love leaving them behind and hope they bring a smile! If you're interested, you can get yours right over here. This is my cousins son, Ayden! I just call him my nephew because my cousin Derrick might as well be another brother! This photo, this day was super special because Ayden finally warmed up to me! We bonded over nuts + oranges! Pretty perfect, right! This was for my friend Kelly Rae's #thewearyourjoyproject I'd just been out running and everything appeared in neon. Bright blues and greens. Was so inspired by all the color I decided to wear lots of color this day too! Love this project and the awareness it brings. How will you wear your joy? My mom + my dad are November babies! For my mom's birthday we all spent the day downtown eating Tapas and listening to jazz! There was a LOT of laughter! Really grateful to live close to my family in this chapter of life. Cliff and I went to the Renaissance Festival and camping for the first time together! It was a complete and total blast! We managed to get everything we needed for an overnighter in the Smart car! I loved being called "my lady" all day! This was an easy breezy Sunday. I ran, found these words on the garage floor and we spent time running errands together (I bought red lipstick). It was one of those OH HEY- so nice to spend time with you after a week of passing each other on our way to work kinda days. Cliff participated in the Tough Mudder on a what felt like a gillion degree day. It was totally impressive + so fun to watch. Mom + Chloe came with us. I was walking towards them to take a photo and when Chloe saw me she started waving so big. Later in the month she smooched a Buddha statue + hugged every pumpkin at the patch. She's our zen master reminding us how to love. Mom made curtains for two open cabinets in our kitchen from my soul mate fabric! Veggies, of course. We went to Austin for a weekend and got up early to sit outside of REI for their garage sale. It was mayhem once they let everyone it! Think Super Market Sweep! We scored a pair of Vibrams for Cliff for $20 bucks. I cut the neck out of some old t's and ended up having the best time playing with Ned. Hilarious, much needed quality time (for me, he didn't seem to mind either). Eyenie Schultz interviewed me for her Women Living in Neon series and I loved it! We'd been internet friends and this was our first time face:face. Felt like being with an old friend, so much ease + love. Made a healthy chocolate shake + proudly announced my second eCourse called Veg Pledge (will run it again next year by popular demand). Kayla + Chloe came to town for the weekend. Kayla and I had the best time watching Crazy, Stupid, Love making vision books, red wine, pizza, quality convo and laughter. Always lots of laughter. Made a pumpkin smoothie + got an email from a gal asking me if she could illustrate it for the blog They Draw + Cook! Of course I said YES! She said it was her first healthy recipe to draw! THAT makes me all kinds of happy. MY APP CAME OUT! It's free, it's filled with goodness! It's 60 days of tips, recipes + affirmations to fuel your plant powered life! Please download it and tell your friends! Search Kale Yeah in the App Store or on Google Play! We went to the airshow with Mema! I got to sit in a very cool old helicopter. Running, more running. I got new shoes from Vivobarefoot. Took a minute to get used to walking in them but running in them in a breeze! I now rotate between my Vibrams and new Vivos. Running is changing the way I see my body, especially my legs. For years I refused to wear shorts because I didn't think I looked good in them. The Texas weather and doing all kinds of good work on embracing my body has changed that. Took a photo of them in my wee little running shorts that I almost deleted and then decided to breathe, to say I love you to myself and thank my legs for allowing me to run freely! Made me smile. Made me proud. This is what Campaign For Confidence is all about. This month was full of simple eating. Smoothies, lots of them. Overnight oats, leftover breakfast cereal with brown rice and quick saute collards. Our neighbor had the funniest killer pumpkins in the yard. We went to a party as Batman + Batgirl in fleece pajamas (still too hot for fleece, nothing but sweat in there). Had the best vegan dinner at Aunt Mary's on Halloween. I loved watching Cliff answer the door for the trick or treaters! He'd kneel down and put the biggest handfuls of treats into their bags, oooh and ahhh over their costumes. Went for margaritas after the last piece of candy and plastic spider had been given out + closed the place down! P.s. I really love this practice of getting it all down. Hard to believe I've been doing them all year! These all started b/c Cliff and I were talking and wondering what we were doing this time last year... I opened my blog and we got a kinda sorta idea. It was then I decided to document with a monthly photo journal. Hey September, Gosh you seem like forever ago. Looking back, I feel like we accomplished all kinds of good stuff together. Cleaned out my studio closet. Man, that needed to be done! Feels sooooo good. Lots of green juice, a kindness mission with Kallie and Iggy, a trip back to my hometown... first time in over 14 years. I stopped to take a picture of our home and a sweet old gal walked out asking why I was taking a photo of her house. When I said, because it used to be my house she invited me in to see how it had changed over the years. I received the sweetest love gift from a dear friend. Made the house smell all kinds of amazing all month long with vanilla, rosemary and lemon simmering on the stove. We made a bottle cap table for Mema's garden! This was July. It was FULL of goodness. Maybe my favorite month this year so far! Our sweet Ned turned 13 on July 1. It's wild that he's been a part of my life for T H I R T E E N years. He's seen me go through so much change, so much transition, so much growing. I'm incredibly grateful for my sweet fur face kiddo. He continues to teach me the power of presence, of love and the importance of naps. Work life balance was AMAZING this month. Probably because we went on vacation and I truly stepped away for a moment. Sometimes I get SO zoomed in on my to do list. Going out and just living my life brings so much balance for me. It keeps me fresh, keeps me sane and keeps me making decisions from inspiration and spirit instead of overwhelm. July felt really in the groove... excited about what is happening and what is coming in the near future. Completed another Group Coaching Session this month and scheduled my first in person workshop for later this year in Boston! SO excited! Went to John Mayer concert with Aunt Mary! Had a BLAST! Cliff and I went on VACATION IN CALIFORNIA! Santa Barbara, Ventura + Catalina! Catalina was breathtaking! Snorkeling was magical and the whole trip was full of laughter, love, reading, togetherness, connection and avocados! We came home with an entire carry on suitcase FULL of avocados from our friends giant tree in their backyard. Went to Chloe's first birthday party in Austin. Biggest 1 year old birthday party I've ever been to. That little lady is so very loved. Kayla and Brain are doing an amazing job raising her on whole foods. She's a one year old veggie loving, vegan! I helped with decorations. I am a paper chain making machine! Flew to Boston for a weekend of fun! Went jogging, twice! Went sailing for the first time and LOVED it. Reunited with a dear old friend. Had the best little dinner for three and was in bed by 11. Celebrated two little people in a growing belly all weekend long. Spent time among women I admire. Illegally parked to get a photo at the entrance of Harvard. Lizzy was accidentally taking video instead of a photo and it was PERFECT! Just so fun!